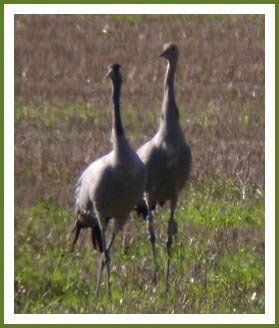 The very first PTT deployment in 2011 was inspired by two crane siblings that were first color-banded in Outokumpu, Finland in the summer of 2010 and then recovered in Hula, Israel in the spring of 2011. The same territory was occupied also in 2011 and the pair reared one offspring that was fitted with a 20 g leg mount PTT (North Star). This crane was also named after the municipality Outokumpu as “Outo” meaning strange. 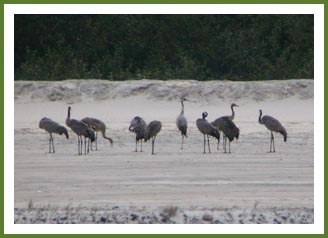 Also Outo’s family eventually joined the flock of cranes roosting over-night at Vuonos-mine, Outokumpu. 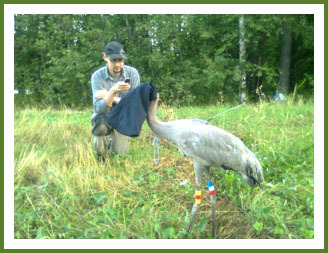 Unlike tens of thousands of cranes that set off 15.-18.9.2011, Outo and his family kept fuelling in N-Karelia until 30.9.2011. 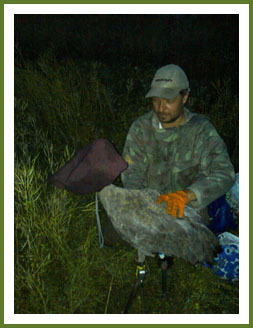 In the summer of 2011 a nearly fully-grown chick of the Eurasian crane was captured and fitted with a 20 g leg mount PTT (North Star) by Petri Suorsa, Janne Leppänen and Jukka Matero in Polvijärvi, Finland. The crane colt was named after his natal territory Ruvaslahti as “Ruvas”. The family of Ruvas utilized the same breeding territory from where Goljat-crane was satellite-tracked up to Egypt in the previous season 2010. As the unit of Goljat stopped transmitting whilst the migration was still ongoing, we now hope by tracking the sibling of Goljat, to be able to retry exploring the eastern migration route or maybe witness a change in between-year migration tactics. So far the crane family appears to follow the same script as in 2010: the fist stop-over is in Estonia. 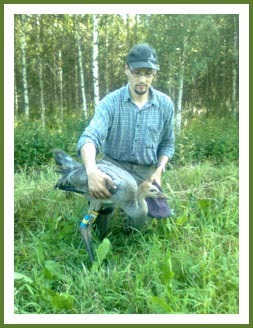 We also captured another crane colt in Polvijärvi and harnessed it with a 80 g back-bag PTT (North Star). Also this colt was named after its breeding site as “Horsma”, meaning the willow herb. Having fledged the crane together with its family joined either a flock of 200 cranes in Vuonos-mine night roost, Outokumpu or stayed overnight in the shallow shore water of isles in the Viinijärvi-lake. The fuelling for migration took however place in the cultivated fields of the natal home range. 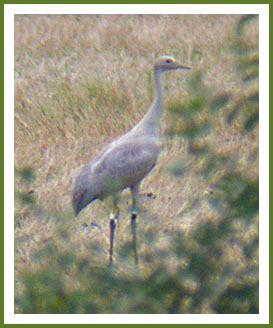 Outo-crane together with his parent 18.9.2011. Outo has just arrived to a roosting place at Vuonos, Outokumpu 29.8.2011.